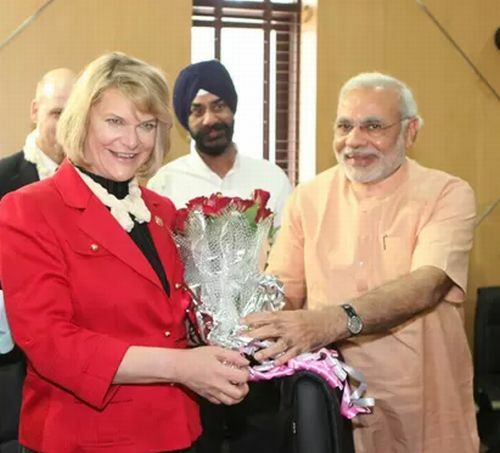 Rediff.com » News » Was US Congress delegation paid to praise Modi? Was US Congress delegation paid to praise Modi? Amidst a raging controversy over the funding of the visit of three members of the US Congress, who have spoken for an American visa for Gujarat Chief Minister Narendra Modi, the Congressmen rejected allegations questioning the legitimacy of their trip. The visit of a group of Americans including the three Congressmen -- Aaron Schock, Cynthia Lummis and Cathy M Rodgers-- and some businessmen has now been mired in a controversy following reports that the team members may have paid between $3,000 (Rs 16,000) and $16,000 (Rs 8.68 lakhs) each for the trip. Organised by Chicago-based National Indian American Public Policy Institute (NIAPPI), the trip included visits to Bangalore, Tirupati, Jaipur, Ranthambore Tiger Reserve and Golden Temple in Amritsar and a 'Bollywood Extravaganza'. The team met Modi on Thursday, praised his work and invited him to visit the US, saying they will work to get him a visa, denied by the country for his alleged role in the post-Godhra riots of 2002. Following reports in an ethnic Indian daily in the US on the trip, the Congress and BJP traded attacks on each other. Congress Spokesperson Rashid Alvi said it was a "shame that the Congressmen were paid for getting a visa and certificate of development for Modi". Vijay Jolly, convenor of Overseas BJP, rejected the charges, saying the Congressmen have spent their own money and there was no impropriety involved. When questioned about the charges, Schock first reacted asking what was the issue involved. "All I would say is that our trip here was signed off by the appropriate authorities in our government...and specifically by the House of Representatives. I would simply say that three members of Congress don't just leave the country. "So I am not going to get into all the nuances. Certainly some people do not like the fact that we are here...perhaps some people do not agree with what we are saying here...but certainly as American members of Congress we have a free right to come over here," Schock said. "I have checked appropriate boxes necessary to make this trip legitimate and well within all the rules and accordances of US Congress," he said. NRI businessman and founder of NIAPPI Shalabh Kumar said, "There is a very strong house ethics committee that disapproves or approves visits by Congressmen to other countries". "So an organisation like NIAPPI that is a think tank that sponsors visits, and trade people who want to go and establish business," Kumar said. Alvi said, "One feels ashamed over this kind of news. It is an insult to a nation. The Congressmen were given Rs 9 lakh each so that America can give him (Modi) visa and a certificate of development. "This is unfortunate. If the money had been spent in Gujarat for the poor and development, then it would have been much better," he said. Jolly said there was no controversy at all. In America, people even pay for attending a dinner with the President. "The US businessmen wanted to come to India. They spend their own money. They have been attracted by Narendra Modi's governance," he said, attacking the Congress for making an issue of the trip. Gujarat Congress billed the visit as "nothing but a marketing gimmick by some global public relations firm to market Modi'. Congress President Arjun Modhwadia alleged that an impression was created as if it was an official US delegation and the US government itself has extended the invitation to Modi to visit America. Why are BJP leaders worried about Narendra Modi?